Homeowners from a private apartment building in Assen have wanted to go to net zero energy (NZE) for three years now. Now that they have secured finance they are finally set to realise this goal. Their homeowner association is the first in the country to finance a NZE project with financing that is building-linked. These types of pilots are essential for developing a nationwide financial product for these projects. Such a financial product would represent a great step forward in realising energy transition goals, as it would enable more private apartment buildings to adopt net zero energy. And the good news is: building-linked finance has been included in the recent coalition agreement of the Dutch government. Three years ago Assen Council put out a call. They were looking for pilot homeowner associations interested in renovating to net zero energy levels. The manager of Ellen’s homeowner association quickly registered their interest and this was the beginning of a long collaboration between Assen Council, Ellen’s homeowner association & its residents, Segon consultants, the Province of Drenthe, the Drenthe Energy Organisation, the Triodos Bank and builder Renolution. Assen Council became inspired to pursue NZE after a housing corporation in Drenthe which was involved in the ‘deal Stroomversnelling’ took the initiative to go to NZE. The ‘deal Stroomversnelling’ was a deal made in 2013 between Dutch building contractors and housing associations to refurbish 111,000 homes to NZE. 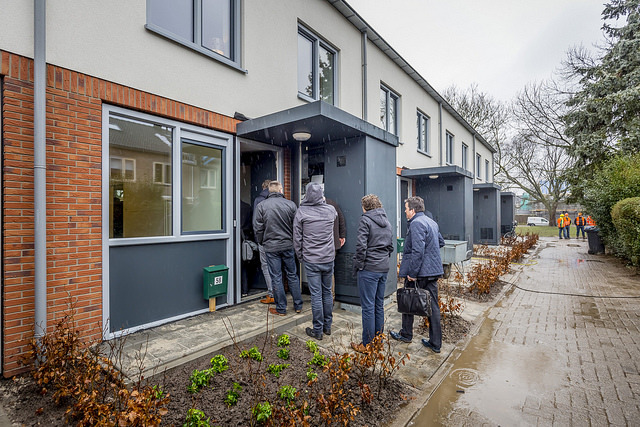 These days the step to NZE is relatively easy for social housing associations in the Netherlands due to a new regulatory tool that allows landlords to charge extra service costs (an “energy plan”) to tenants for a Net Zero Energy building. A NZE renovation (or new build) is financed in two ways: through energy cost savings and by reduced maintenance and repairs costs. Both are part of the business case. The objective is that tenants have the same monthly expenses – they now simply pay the housing association an energy service fee instead of their former energy bill to an energy supplier. The housing association can now use this new income stream to pay a large part of the renovation. Whilst the business case for NZE renovations is clear for social housing associations in the Netherlands, it is a different story for private homeowner associations and individuals. There were, and still are, no long term loans (>25 years) available to them to invest in NZE. Therefore, for a homeowner association, loan repayments would be significantly higher than residents’ current energy bills and the costs to residents would go up. The longer loan term brings the loan repayment costs down to a level comparable to the current energy bills for the residents. In this way the retrofit comes as close as possible to net zero cost for residents. Their 30 year maintenance contract is also worked into the costs, so it is nicely organised. Homeowner association Ellen oversees 28 apartments within a building of five levels, of which four are for living. During the retrofit each whole flat is essentially encased in a new facade, with balconies and walkways becoming interior. The old balconies are converted to French balconies with double doors and the walkways get a special glass system that is self opening if the interior gets to warm (24 degrees) or in the event of smoke. This new facade offers a 95% saving on heating requirements. The necessary energy is generated by solar panels on the roof and all residents get their own ventilation system in the ceiling with a spiral heating system behind it. The new facade is ‘factory made’ and affixed to the flats on site. Building company Renolution (also a member of the Stroomversnelling) renovates one residence per day and handles communication with the residents themselves. The residents have been enthusiastic from the start and Renolution talked with each household about the possibilities for personalised extras. 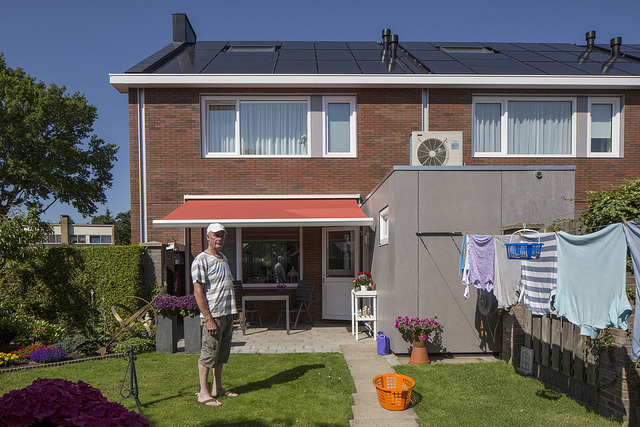 The innovation programme VvE’s naar nul-op-de-meter (Homeowner associations to net zero energy) has been running since 2015 and originated from the since completed Energiesprong programme. The pilots supported through the programme have provided a platform to experiment with systemic changes within the sector. Facilitation of this vital task is shared by Platform 31, supporting the pilots, and Stroomversnelling, working on the necessary regulatory changes and supporting innovation (partly financed by the Interreg NWE programme E=0).